Do the Atlanta Hawks have the most overrated roster in the entire NBA? They are the poor man's east coast version of the Denver Nuggets. They come with a ton of swagger, but fail to back just about any of it up. Joe Johnson gets east coast press. 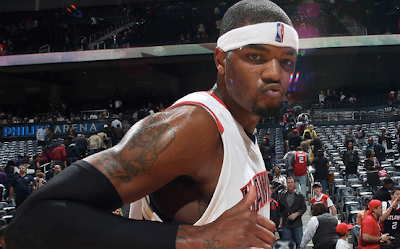 Josh Smith is the amateur version of LaMarcus Aldridge. Jamal Crawford...wait he still plays? Mike Bibby's brain melted back in the 2002 Playoffs. They play less defense than Memphis yet can't score like the Suns. And that should be just about enough to get Hawks fans fired up I'd say. The Hawks are so boring, I couldn't even find any dirt on them. So check out the A-Town dancers who pulled off this fantastic Thriller tribute.